Hypnotic Filigree Pendant on Sterling Silver Bracelet, "Elegant Beauty"
By Nancy Quispe of Peru, this bracelet is destined to captivate the original trendsetter who appreciates a touch of tradition. 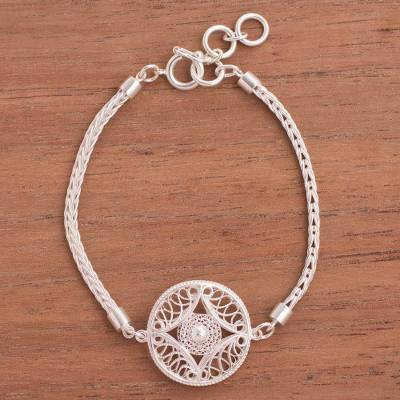 Handcrafted of sterling silver, the bracelet is centered by a pendant featuring a hypnotic filigree pattern. You can find sterling silver filigree pendant bracelet 'Elegant Beauty' by Nancy Quispe in jewelry categories such as Modern Bracelets, No Stone Bracelets, Silver Bracelets, Sterling Silver Bracelets, Filigree Bracelets and Pendant Bracelets. Enjoy exploring these sections for other Novica treasures.